You will be given a reference e-book to read which has 370 pages And the test will be based on that e-book , you can take final test within 1 year of purchase. Marketing. This type of service is primarily conducted using a contact center and involves telemarketing, sending outbound emails, poling and surveys, marketing campaigns management and drafting and sending responses to inbound emails. Support. This type of customer service usually include resolving billing queries, taking orders, registering new customers, recording complaints and activating accounts. Technical Support. This requires various technical support services and these include application support, data verification, problem resolution and address update with the help of the technical help desk. Sales. The customer service tasks under this function include outbound and inbound sales, co-browsing, web call-back and web chat. Customer Analytics. This involves profitability analytics, complaint analysis, reporting and quality auditing. If your dream is to become a certified professional in the customer service field, then you have to know that Brainmeasures, with its professionally laid out customer service certification program, can offer you the kind of help that you need. Brainmeasures customer service course aims to provide information about how to offer the best services to various customers. Because of the proven comprehensiveness of this online certification course, you get the chance to learn more about the different types of customers including the loyal, wandering, impulse, discount and need-based customers so you will never find it hard to meet their demands and more effectively deal with them. The kind of customer service training that you can get from Brainmeasures is also effective in honing your skills in quickly resolving certain customer issues and complaints. 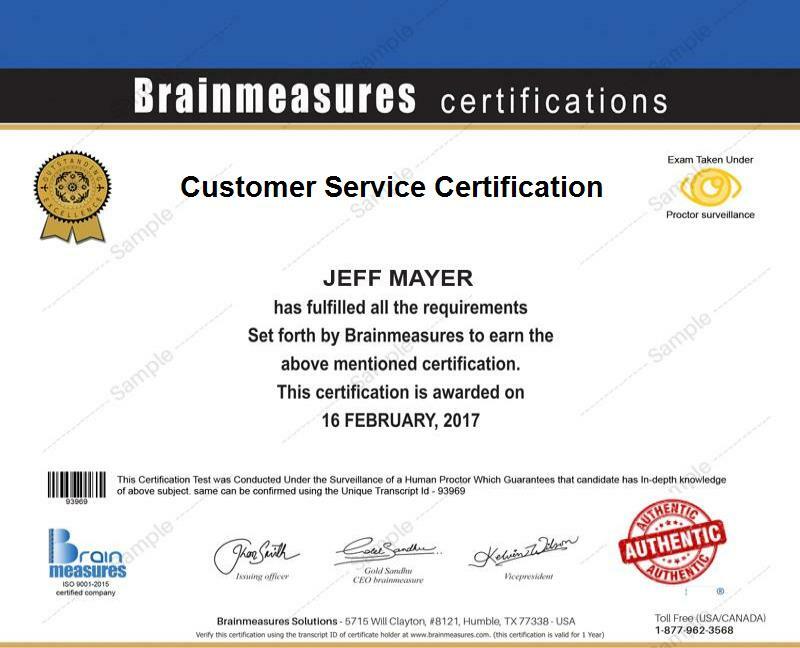 The quality and accuracy of information provided combined with the proven comprehensiveness of the customer service certification course offered by Brainmeasures can make it easier for you to pass the customer service exam and finally grab a copy of your certificate. A lot of people can receive numerous benefits from enrolling in a customer service certification course. It is suitable for technical and support personnel, customer service representatives, account managers, small business owners, field service representatives, managers and any other professional who wishes to receive the best customer service training so they can start providing the best support to their clients while also helping the customer service staff in reinforcing their skills through proper training. Earning big after completing your customer service certification is never impossible considering the fact that there are a lot of huge business organizations who are willing to pay more just to make sure that all the queries and concerns of their customers are answered and dealt with right away. As a customer service certification holder, you can expect to earn within the range of $45,000 to $72,000. You may also charge your employer on an hourly basis which can usually go around $10 to $31 per hour.